3.7 out of 5 based on 58 bloggers and 12 commenters. 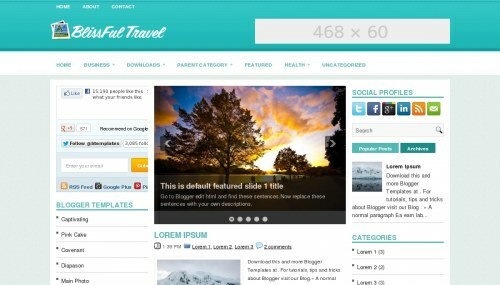 BlissfulTravel is a free blogger template adapted from WordPress with 3 columns, left and right sidebars, ads ready, footer columns, slider, social bookmarking icons, posts thumbnails, tabs and drop down menu. How do I edit the social profiles sidebar to attach my profiles? Sangat keren untuk blog, thank’s Mr.
how can i edit social links, and setup my own profile links, thank you. Hi, can I use this templates over here on my blog. is a blogspot one or has to be a WordPress?